Barons is inviting entries for its 2012 sales at Sandown Park Racecourse and, with seven auctions at this prestigious venue, whether you’re buying or selling, Barons will be the place to go in 2012. The calendar kicks off on February 28th with Barons’ first Classic, Collectors, Sports Cars and Thoroughbred Motor Cars auction of the year. This early date is the perfect opportunity to refine that collection of classic or collectors cars, make room in the garage for another long-desired machine, to acquire a new addition to the collection or get your foot on the first rung of the classic ownership ladder. As always, Barons is also holding a number of themed sales, with its ever-popular Jaguar Heritage Auction (a ‘must’ for fans of the big cats) on May 29th, and British Heritage Auction on September 18th. These two sales will, like the Yuletide Classic (December 18th), take place in Sandown Park’s magnificent Surrey Hall. One clear pattern emerged in Barons’ sales of 2011 – the market is definitely cooling for average examples of average classics. So what is still finding favour with buyers? 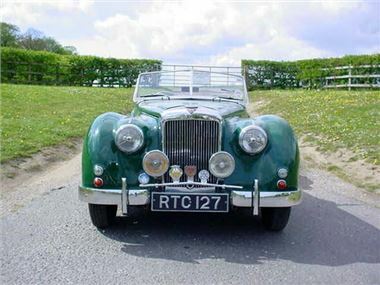 Nicely-prepared cars of all ages and types have a ready market, and with the marketing and competitive bidding that a Barons auction can provide, exceptional prices are very possible. In 2011, for example, all nine E-types offered in the annual Jaguar Heritage sale were sold, and at the November sale a nicely presented Healey 3000 sailed past its reserve to make £39,000 gross. At the other end of the spectrum, barn finds remain strong, firing the imagination of restorers who wish to stamp their own mark on a vehicle and get a real sense of achievement. Barons hit the headlines in 2010 when it achieved £206,000 (more than twice top estimate) for the ‘lost’ 1958 David Brown Aston Martin DB2/4 MkIII drophead, but in 2011 a number of exciting restoration projects also scored well over estimate. These included an unfinished Suffolk SS100, which made over £35,000 and a true 'barn find' Mercedes 250SL, with no keys and needing much TLC at £12,500.